I was hoping to have my living room reveal today. I am off work. I borrowed a steamer and got the wrinkles out of my new curtains. But, it's a really cloudy, dark day, and I decided to give up on the idea of the whole room reveal. In it's place, I am posting a outdoor vignette of a tool box painted by a good friend who owns a local occasional craft and collectibles shop, The Tattered Angel. 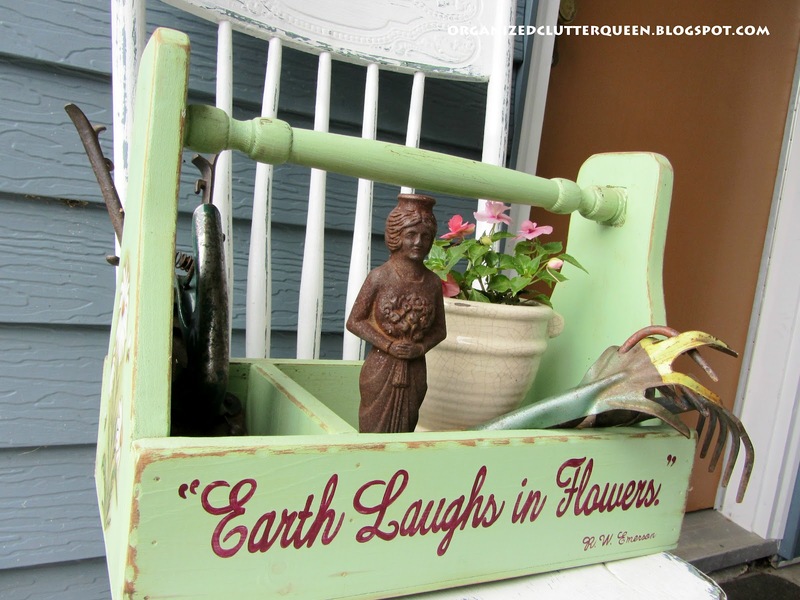 The green tool box has the quote "Earth Laughs in Flowers" by Ralph Waldo Emerson. It is sitting on a white chippy chair next to our attached garage side door. 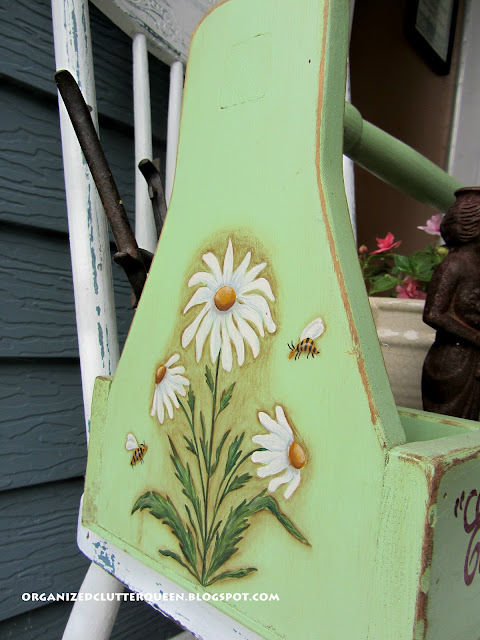 Daisies and bees are painted on the ends. 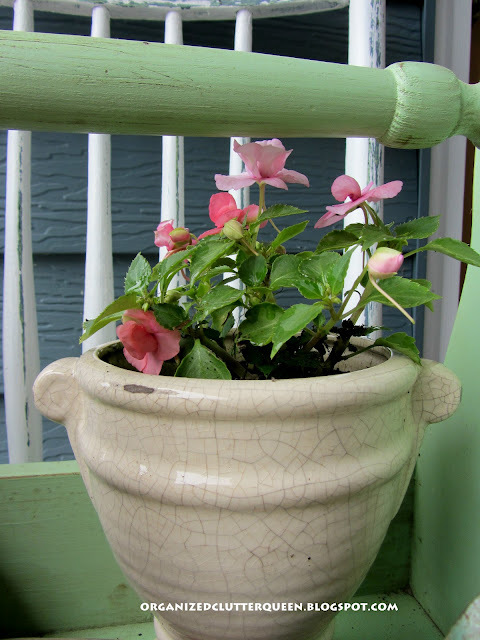 Inside the toolbox is a distressed pot with double impatiens, vintage garden "scratchers" or hand rakes. Also vintage grass clippers and an iron lady statue. I bought this little lady about 15 years ago at a garage sale for about 50 cents. It's a heavy iron piece with a hole in the top and bottom. Not sure what she was from, let me know if you recognize her. It's perfect for a garden or flower pots with the bouquet. 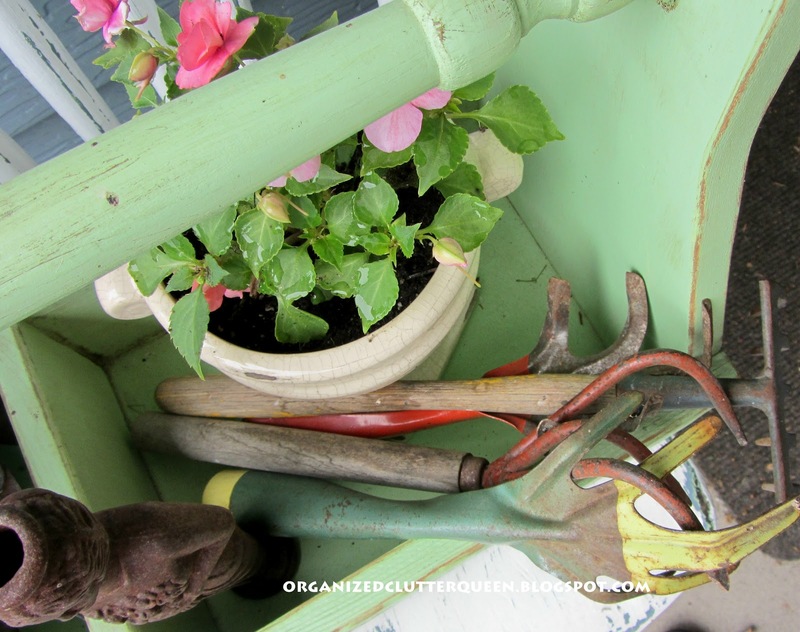 Do you collect vintage garden hand tools? I do. I also collect bigger farm tools. They are perfect for decorating flower gardens and outdoor spaces. Love the little lady and the tool box. That green is beautiful in color and I love how it is painted. I love the toolbox! Its green color and the message on it! I would love to collect some of those tools! I guess I have to look for them! Carlene.. I just love that iron lady figure.. not sure what she would be originally used for with holes on top and bottom but she is a treasure! I hadn't remembered that you had one of those garden totes either..LOL. Great display! 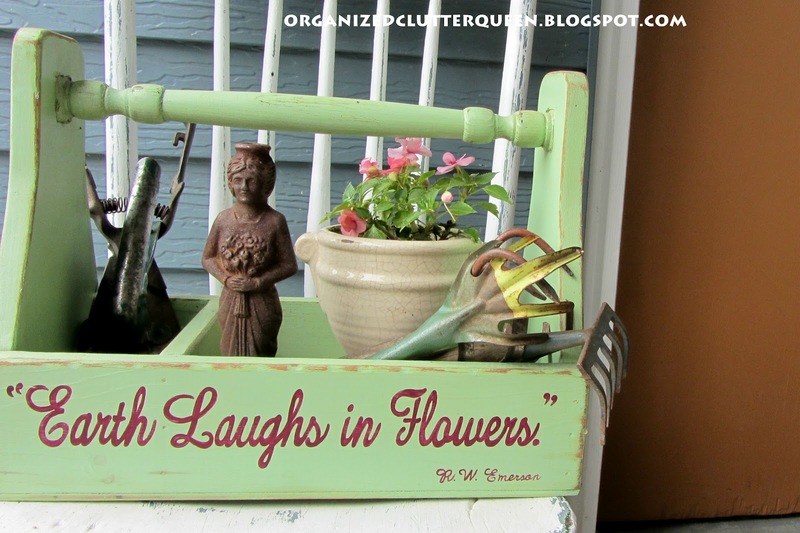 Carlene, your tool box is perfect sitting there with your garden goodies. The green is so pretty and fresh. 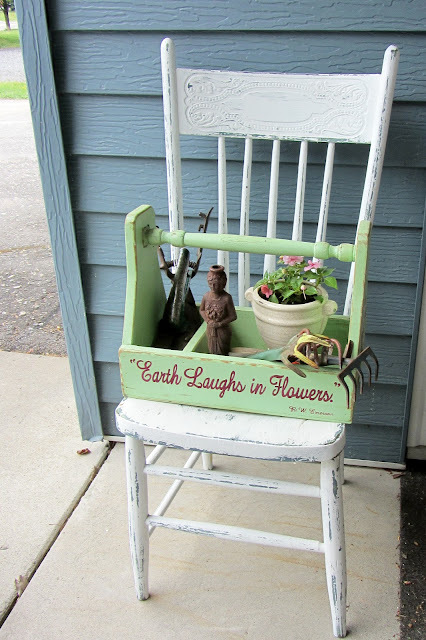 Your little back door vignette looks so cute! I know what you mean about dark dreary weather. You definitely need to do your reveal photos on a sunshiney day. I hope we get one soon! Hi Carlene, thank you so much for stopping by and commenting on my rehab for a rascal post. I am in love with your little vignette. The green, pink, white and the rust against the gray blue of the wall make for a sweet sight. I hope you'll stop in again. How cute! Love the quote too and the pretty birds and bees painted. Thanks so much for linking up to the newbie party. Love that green garden bin holding all your special things you collect. That is just so sweet! I love the color and the painting on it. What a pretty addition to your outdoors! Thank you for sharing at TTF and have a great day! Love everything about this! From the iron lady (isn't that Margaret Thatcher's nickname?!) to the garden scratchers to the quote to the chippy chair! Oh no, look what you've started - now I want to start collecting old gardening tools! 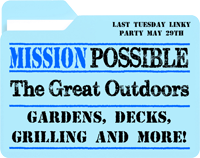 So glad you joined our Outdoors party! ... so happy you shared at our Great Outdoors link party! Carlene, Your garden tool carrier is really neat. 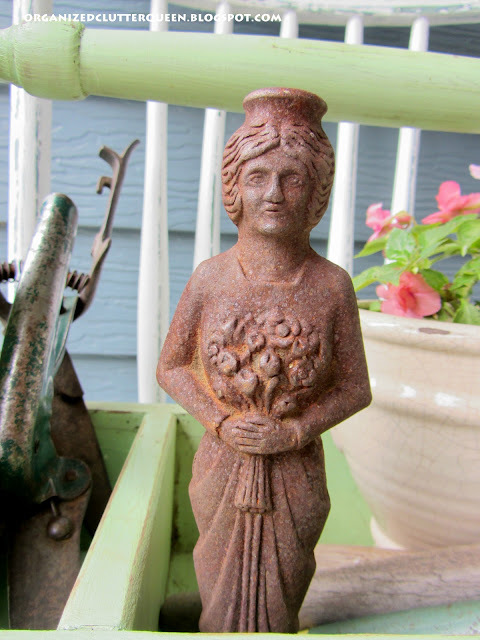 Love the cast iron lady and vintage garden tools. Good finds! I'm loving that tool box, and the lovely old pot. Also love chippy tools of any kind. I don't think I've ever heard that saying before but love it. The vignette that you created is really gorgeous. 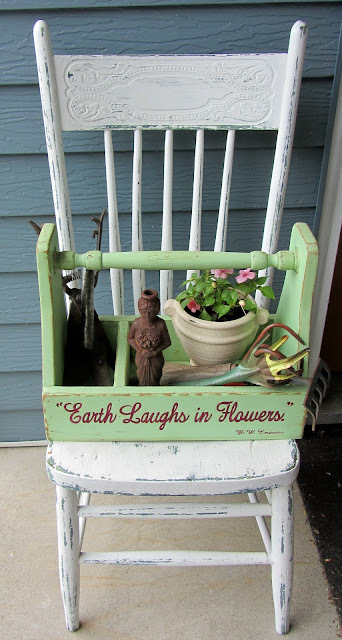 Now I'll be on the lookout for old garden tools, and the green chair is really cool. Thanks for sharing your creative inspiration over at Sunday's Best! I love it. 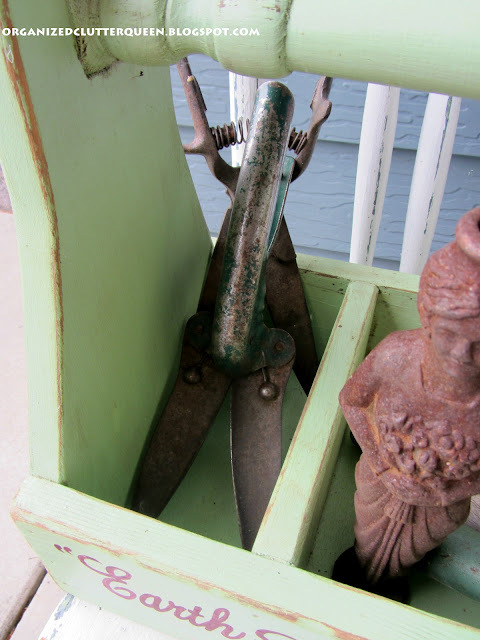 Vintage tools in an old tool box, very inviting for your patio!! Thank you so much for sharing at our party! Hello wonderful friend! I just wanted you to know that I featured your painted toolbox today! Thanks for linking up this incredible project!